Expedition and Wilderness Medicine provides medical support for BBC Blue Peter Presenter Helen Skelton as she attempts to be the first woman to kayak solo the Amazon. Sarah Outen – makes it with a little help from EWM!! The first Britian to row in the India Ocean and the first female ever! About the writer. Dr Kirstie Nichol is a G.P. with a keen interest in expeditions and the medical issues or remote locations. She has attended the Expedition and Wilderness Medicine course in Keswick and the Polar Medicine training course in Alta, Northern Norway and worked as an expedition medic for Across the Divide Expeditions in locations as diverse as Kilimanjaro and Peru. 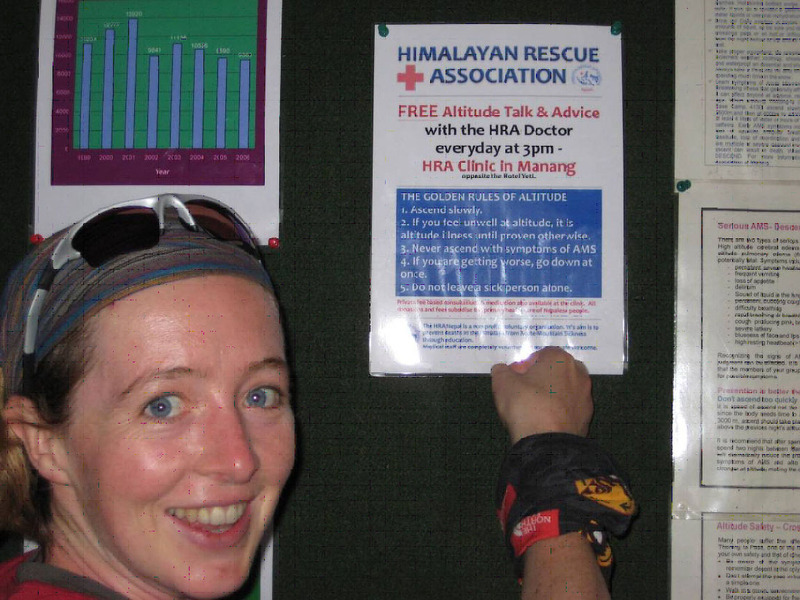 In 2007 I left ‘normal’ working life as a GP in Haddington behind for a while to work for the Himalayan Rescue Association in a high altitude clinic in Nepal. The HRA is a Nepalese voluntary non-profit organisation formed in 1973 with an objective to reduce casualties in the Nepal Himalayas, especially in view of the increasing number of Nepalese and foreigners who trek up into the remote wilderness. Nepal alone now receives more than one hundred thousand trekkers from around the world every year. It can be easy to under-estimate the dangers of altitude illness; deaths from these conditions are all the more tragic because they are entirely preventable. Working at the clinic involves a mix of primary health care for local people including home visits, providing an emergency medical service for trekkers and the provision of daily lectures for trekkers emphasising the prevention, recognition and treatment of altitude illnesses. Because rescue is difficult in Nepal, prevention is a key part of the role. Thus, the HRA increases the safety of the trekkers encouraging tourism, which boosts the Nepalese economy, and also uses the donations and charges to the foreigners attending the clinic to provide much-needed free healthcare to the local people. The Manang clinic where I worked is in a very remote part of northern Nepal situated at 3570m in a small mountain village surrounded by the 8000m peaks of the Annapurna mountain range. It is an incredibly beautiful and peaceful place. 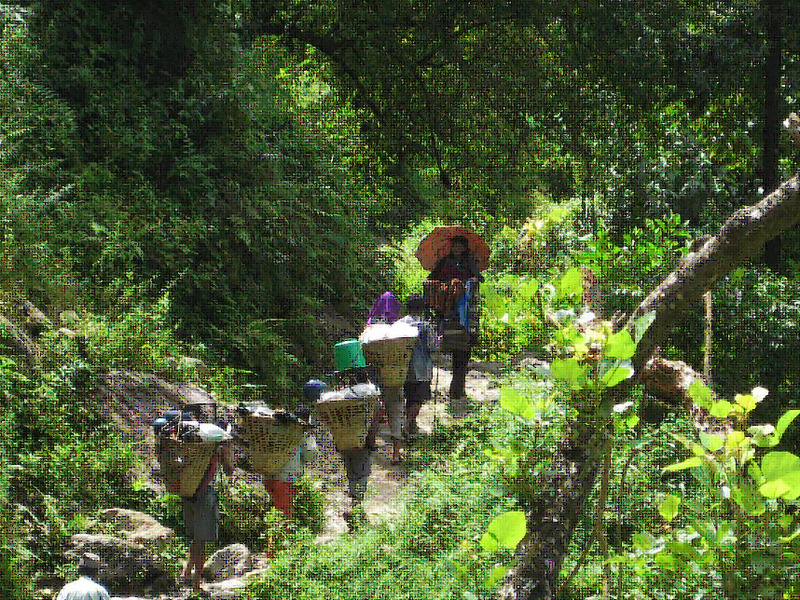 It takes seven days of trekking to reach it from the nearest road and the clinic is the only source of western medical care for the people there. The staff consisted of myself and another volunteer doctor and two Nepali staff who helped with day to day running of the clinic and translation. The clinic is open 24 hours a day, seven days a week during the two main trekking seasons. Manang is a mainly Buddhist area and Tibetan Buddhist philosophy is evident all around and added a very interesting aspect to our care of the local people. Life at the clinic is basic but rejuvenating. I slept in a tent for the best part of four months, there is no hot water and no heating and the food consists of daal bhaat every day- a Nepali staple of rice and lentils. The clinic itself has a reasonable range of medications to cover most situations and an oxygen concentrator which is the life line. This comes with its own problems though due to difficulty maintaining it and getting it adequately serviced. Also the only power supply is by solar panels which charge a battery and therefore if the weather is bad it is necessary to conserve power for the concentrator and conduct all business by torchlight and candles! It is difficult to get re- supplies in a hurry as they require to be sent from Kathmandu and take at least eight days to reach the clinic by mountain porters. Therefore an ability to do your best with what is available and be innovative is required. It can be refreshing to get back to the basics of medicine, relying on your clinical judgement with no back up from labs etc. The commonest presentations among the local population were respiratory tract infections, diarrhoea, joint pains and gastritis but we also dealt with emergencies such as acute abdomen, myocardial infarction, and stroke and one night I was called to my most feared situation of an obstetric emergency. Thankfully, eventually, a healthy baby was delivered, with a combination of assistance to the mum from the limited obstetric medical supplies we had available and the blessings from the lama. Nature is an incredible thing! As mentioned the locals did not pay for their healthcare at the clinic but the clinic did not provide evacuation costs for them if they required hospitalisation. It therefore very much depended on their position within the community what was possible for them. For instance one local man who was the owner of the roksi (local brew) shop and therefore well known in the community, required emergency surgery and was an ‘in-patient’ with us for a few days whilst his family gathered a loan from prosperous teahouse owners and village elders, enabling him to be evacuated by helicopter to Kathmandu. However life is much more difficult for others and I treated a young fifteen year old mule herder with life threatening pneumonia whose only means of evacuation was to be carried in a basket on the back of a porter; a journey which took five days for him to reach a basic hospital. The commonest presentations in the trekkers were diarrhoea and acute mountain sickness. We treated several cases of life threatening high altitude pulmonary oedema and arranged helicopter evacuations where needed. The helicopter can only fly to this altitude during settled weather in daylight hours and even in an emergency often takes more than eight hours to come. 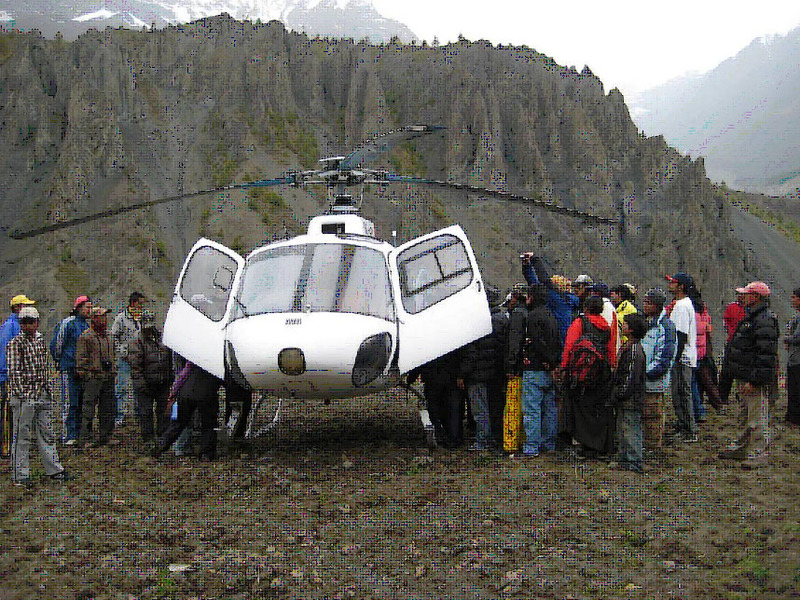 Other means of evacuation are by horse or being carried by porters. Often these means are quicker and can be life saving at altitudes above Manang rather than waiting on a response from the helicopter. During our time we also ran a pilot study of a small clinic at Thorung Phedi 4500m, a teahouse stop where trekkers on the Annapurna circuit stay for the night before they attempt the Thorung La Pass 5416m. There is plenty exposure to high altitude medicine here! It is amazing the range of people that come to trek in these mountainous areas, many with no or limited previous experience of mountain environments and of course others with a wealth of experience. Some of the life threatening cases we saw among the trekker population were related to people with pre- existing medical conditions that were compromised by being at altitude. They either hadn’t been provided with adequate information about the risks of altitude or had failed to accept that the information they were given really did apply to them. There is an important role in pre travel health consultations to educate travellers to high altitude areas about the risks, taking into account their past medical history. I carried out a questionnaire based study among the trekkers with the aim to establish whether advice about altitude illnesses was given at their pre-travel health consultation (i.e. when attending for vaccinations); what this advice consisted of; where they received it; whether they were advised to take or given a prescription for acetazolamide and if so at what dosage and when they were advised to start it; and whether they sought information about altitude illnesses from other sources e.g. internet, guidebooks. I am currently processing the results of this study but from the initial data survey it looks like we certainly could improve the information we give to travellers to high altitude areas to reduce their risks of these life threatening altitude illnesses. There will be more on that to follow once I have completed the data analysis. My sincere thanks go to my partners for permitting me this period of unpaid leave and to the Alastair Short Memorial Award which provided me with financial support for this work and study project.